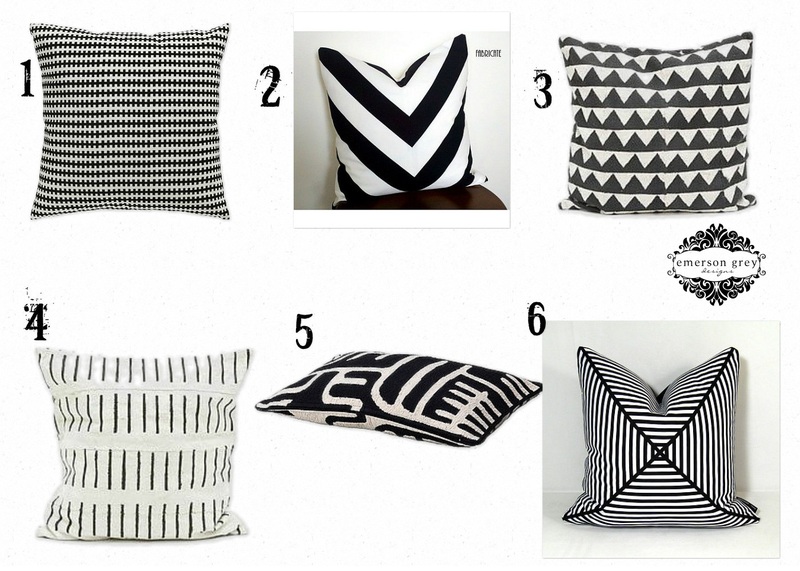 I wanted to gather my most favorite black and white pillows for you in case you’re looking to add a bit of black and white decor to your home. #1 I have one my son’s bed actually and you’d be surprised by the quality of it, as well as the insert it comes with. Got to love Ikea. #2 is such a creative pillow. It uses Ikea wide striped fabric, but is sewn into a chevron pattern. You can find it at Thfabricate’s etsy shop when they get back from vaca. #3 and #4 are from Fine Little Day and I absolutely adore them! #5 is from Ikea as well, but is such a great lumbar size I had to include it too. #6 is so graphic and so fun. You can find it at Mazizmuze’s etsy shop. And I have to say my logo doesn’t look too shabby amongst all that black and white fun!